Playing an instrument was required at Daneyal Anwar’s public elementary school. He couldn’t practice drums in his family’s apartment building, so he chose to play violin; that was what his sister played, and naturally he had to out-perform her at everything. Anwar, a senior majoring in cognitive science, now produces experimental electronic music under the stage name Anvar. On Aug. 3, he released his debut album, “Sequences,” after 11 months of production. With it, he hopes to challenge the status quo of modern music and more importantly, make listeners think. Anwar’s music has evolved greatly over the years. At the beginning of his music-making career, he threw together a bunch of hip-hop and rap tracks in Fruity Loop Studio (now known as FL Studio), a software that Anwar describes as just a step ahead of GarageBand. His early influences came largely from artists like Pharrell Williams and Radiohead artists. Though his musical library has grown since then, it still has ties to the early days. Today, he listens to a little bit of everything, largely depending on his mood. 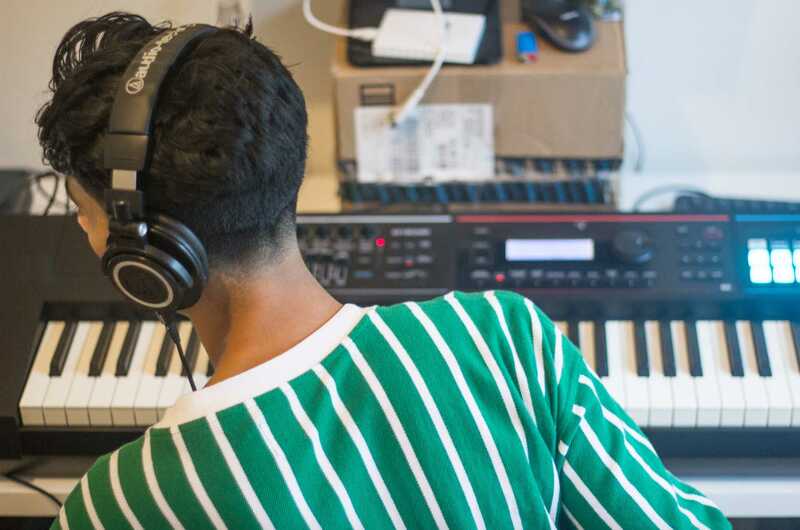 Anwar has been making music for half a decade, but “Sequences” was the first work he was ready to put out to the world. He explained that the most important thing for himself and other musicians to do is get their ideas onto the paper — or, in his case, onto the program. Most of the album was created in New Zealand, where Anwar spent the spring semester studying abroad. He arrived earlier than the bulk of his classmates and put in over seven-hour days working on music — taking a short break, then going back to work at night. It was in New Zealand that he met Caitlin Turner, the vocalist featured on “Sequences,” and recorded all of the album’s vocals, which have a deliberately non-human sound. That voice in his head, along with a slew of other influences, play a huge part in shaping Anwar’s music. That humility is evident to strangers and friends alike. Forest Clements, a guitarist featured on the sixth song on the album, said Anwar has a rare work ethic among musicians. The two met in their high school orchestra and have remained friends ever since. While producing the album, Anwar reached out to Clements with a song, “The Conch.” Clements happily joined the project. Clements explained that the duo worked so well together because of their shared approach to “making the puzzle fit” with music. “When I’m making music, I try to express myself through other people’s voices and other people’s perspectives, which is an exercise in some deranged form of humility, but I think it helps me be creative,” Anwar said. The seventh track, “Walk With Me,” is an ode to the David Lynch series “Twin Peaks,” channeling its psychedelic world but with an experimental spin. The last song, “Snot by Alex G,” is Anwar’s favorite — a remake of instrumentalist Alex G’s original track, once again with Anwar’s uncommon flair. As a cognitive science major, Anwar has researched how extreme music affects people’s emotions. In the lab, small pads with electric conductors are placed on a subject’s arms, and researchers play extremely sad or happy music while monitoring the changes that take place in listeners’ bodies. Anwar ultimately wants to continue with this cognition research, expanding testing that he hopes will help with recommending treatment plans for mental health patients. Anwar believes music and other forms of therapy can be a solution to mental health issues rather than over-prescribing drugs. But even when he’s not in the lab, Anwar always has music on his mind, and it doesn’t seem to be going anywhere. Those new melodies make his sound — they make Anvar.